It will come as no surprise that people turn to search engines to find information about breaking news events. But thanks to Google Hot Trends, which highlights searches that have sudden surges in popularity, we can see just how they search for such information. The assassination of former Pakistani president prime minister Benazir Bhutto on December 27 provides some insight into search behavior during such a crisis. 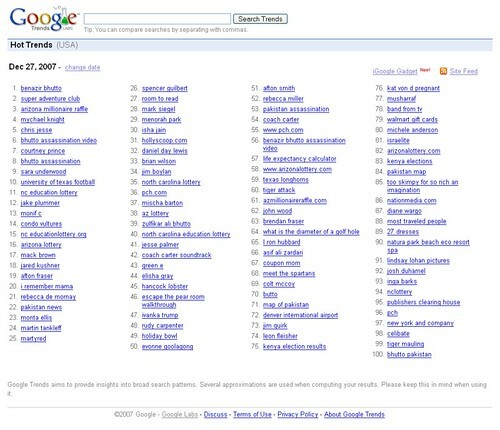 News of the assassination broke around 4 a.m. PST and people immediately turned to the search engines for more news. Among the top 100 most popular daily search terms that Goolge Trends tracks, 14 of them were related to the assassination. In the list below, the number preceding the search phrase denotes where the phrase ranked within the 100 most popular; the time following the search phrase indicates when that search phrase peaked in activity. 1 – benazir bhutto – 6 a.m.
6 – bhutto assassination video – 8 a.m.
7 – bhutto assassination – 7 a.m.
22 – pakistan news – 6 a.m.
25 – martyred – 7 a.m.
39 – zulfikar ali bhutto – 6 a.m.
53 – pakistan assassination – 7 a.m.
56 – benazir bhutto assassination video – 7 a.m.
66 – asif ali zardari – 10 a.m.
70 – butto – 6 a.m.
71 – map of pakistan – 8 a.m.
77 – musharraf – 7 a.m.
84 – pakistan map – 9 a.m.
100 – bhutto pakistan – 5 a.m.
Based on volume, most people searched for information about the specific event in general, so we see a lot of searches that include the main subject’s name: Benazir Bhutto. There was also a high interest in video of the assassination, which would indicate either morbid curiosity or simply the fact that the initial media coverage of the story lacked video. Finally, we see searches that indicate an effort to flesh out the story, illustrated by queries like "martyred," searches for information about Bhutto’s father "zulfikar ali bhutto," husband "asif ali zardari," searches for Pakistan’s current leader "musharraf," and for maps of Pakistan. bhutto pakistan – 5 a.m.
benazir bhutto – 6 a.m.
pakistan news – 6 a.m.
zulfikar ali bhutto – 6 a.m.
bhutto assassination – 7 a.m.
pakistan assassination – 7 a.m.
benazir bhutto assassination video – 7 a.m.
bhutto assassination video – 8 a.m.
map of pakistan – 8 a.m.
pakistan map – 9 a.m.
asif ali zardari – 10 a.m. Consider that, in the US anyway, weekday mornings for most people begin with a quick breakfast (with, perhaps, a morning television news show on) and a drive to work (probably while listening to the radio). With news of the assassination breaking at about 4 a.m. PST, most Americans heard of the news the first thing in the morning, thus you see a surge of general search queries from 5 a.m. to 6 a.m., the general time most people get up in the morning. The one query that stands out among the 5 to 6 a.m. time frame is for Bhutto’s father, which would probably indicate that most of the reporting on the story mentioned that Benazir Bhutto was the daughter of former Pakistani president and prime minister, Zulfikar Ali Bhutto. From 7 a.m. to 9 a.m., people begin searching for information to flesh out the story, including searching for video, for information about Pakistan president Pervez Musharraf, and for maps of Pakistan. The only query in the 10 a.m. hour is for Benazir Bhutto’s husband, Asif Ali Zardari. This is likely a result of the news media’s continuing coverage with stories about Asif Ali Zardari’s arrest on charges of blackmail in 1990 and his subsequent imprisonment. Curiously, no related queries appear within Google Hot Trends after 10 a.m. I don’t know why this is. Maybe people had simply informed themselves to the point that, absent any new news after they returned from work, they simply didn’t feel the need to know more. By the way, Benazir was former Prime Minister (twice elected) of Pakistan.